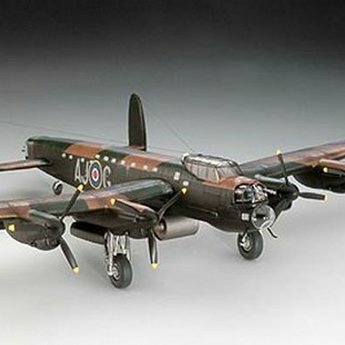 The Avro Lancaster was hired in 1942 and became the best-known heavy bomber of the RAF in World War II. More than 7,300 copies were built for the Bomber Command of the Royal Air Force. © One of the key objectives of the RAF was the destruction of the Ruhr dams, which provided much of the industry of water and electricity. To break such targets with high resistance, a special bomb was, the Bouncing Bomb developed. A special unit, 617 Squadron, led by Wing Commander Guy Gibson founded to carry out this mission. Codenamed Operation Chastise, the mission was carried out by 19 Lancasters during the night of 16 and May 17, 1943. The first two objectives, Möhne and Eder dams were successfully completed, but the two others, Ennepe and Sorpe were bombed without success.